Now that I can take video and send it via my cell phone I have started a Syncwinnipeg Youtube site. This way I can use video to document moment's of sync that can not be fully captured in writing or still pictures. Here is one of my first uploads. I'm singing an icaro of gratitude for the plants while I video my fireplace mantle in my house. After the fact I realized that I start by videoing the Gas fire place just before I focus in on a drawing of my daughter's of the Gas giant Jupiter. Nice work, love the icaro as you walk past the ledge with the bears! You can definitely see your skills within the work you write. The world hopes for more passionate writers like you who aren’t afraid to mention how they believe. Good luck. King Solomon's Temple in the Centre of North America. Frank Albo is a PhD candidate in the History of Art at the University of Cambridge. 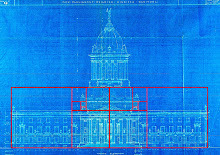 Check out his website for a journey down the rabbit hole that is the Manitoba Legislative Building. For his website click HERE.